A license grants you a certain number of seats that you can fill with any users you choose. These seats can be filled and then later reassigned as your needs change. We’ll cover each of these in detail. To get started, you’ll want to open the Power Pack configuration page by clicking Configure under the Power Pack entry on the extensions administration page. Then click Manage Users. This will take you to the “Manage Power Pack Users” page, with additional links for importing or configuring automatic user licensing. 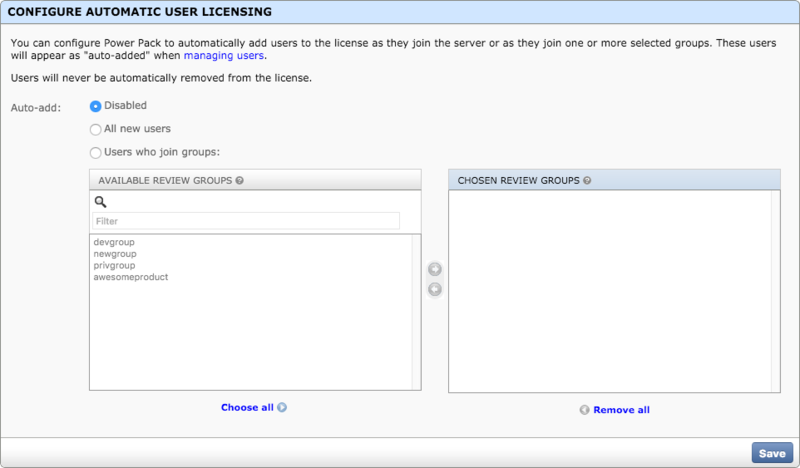 The “Manage Power Pack Users” page lets you add users to your license and remove existing licensed users. Through this, you can see everyone who has access to Power Pack functionality, and when they were licensed. To add a user, type their username and click Add Users. You can specify multiple usernames at once by separating them with a comma. To remove a user, click the checkbox next to their username and click Remove. You can remove as many users as you like at once. You can add or remove users on the command line using the license-powerpack-users and unlicense-powerpack-users management commands. As of Power Pack 1.4.3, if a user is marked as inactive or deleted from the database, they’ll automatically be removed from the license. There’s no need to remove the user from the license manually. If you already have a lot of users on your install, you probably don’t want to type in all their usernames. Instead, you can import them on the “Import Power Pack Users” page by clicking Import users on any licensed user management page. If your license has enough seats, you can import all the users on your system at once by selecting All users. If you want to import users from a specific group, you can select From group, and select the name of the group. This can be repeated for any additional groups you want to import from. Once you’ve made your selection, click Import Users. All users matching the selection will be added to your license (up to the user cap on the license). If you don’t want to manage your seats by hand, you can configure Power Pack to automatically add users for you. This is available by clicking the Automatic user licensing link on any licensed user management page. By default, this is disabled. You can opt-in to automatically adding any new user who signs up on Review Board by selecting All new users. Alternatively, you can choose to automatically add any users who join one or more selected groups by selecting Users who join groups: and choosing the list of desired groups. Once you’ve made your choice, click Save. Note that this will not add any existing users to the license. For that, you’ll need to import users separately. You can configure auto-adding on the command line with the config-powerpack-license management command.